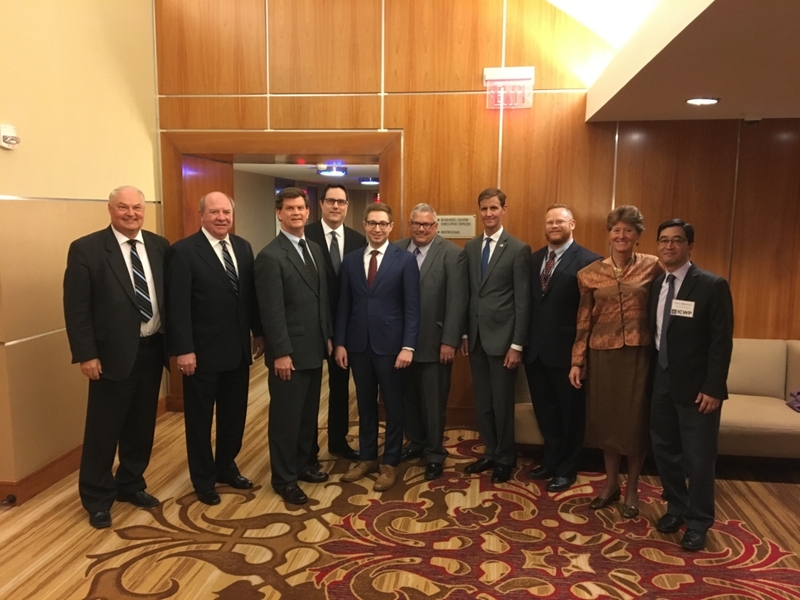 On April 3, a “Water Sub-cabinet,” addressed members of the Western States WaterCouncil (WSWC), Interstate Council on Water Policy (ICWP), National Water Resources Association (NWRA) and National Water Supply Association (NWSA) at a Water Infrastructure Forum in Washington, D.C. The subcabinetofficialsincluded:TimPetty,AssistantSecretaryoftheDepartmentoftheInterior(DOI)forWater andScience;DavidRoss,EnvironmentalProtectionAgency(EPA),AssistantAdministratorforWater;Timothy Gaullaudet, Assistant Secretary of Commerce for Oceans and Waters, with responsibility for the National Oceanic and Atmospheric Administration (NOAA); William Northey, Under Secretary for Farm Production Conservation,U.S.DepartmentofAgriculture(USDA);R.D.James,AssistantSecretaryoftheArmyforCivilWorks; and Alex Fitzsimmons, Chief of Staff, Daniel Simmons, Department of Energy (DOE), Assistant Secretary, Office of Energy Efficiency and RenewableEnergy. Dr.Pettynotedthedifferentagencies’rolesandtheimportanceofpartnerships,withalltheagencies coming together on water. “If the parts of your watch aren’t working together, you are not going to stay on time!” We need to be more effective and are commitment to working with each other to function more efficiently.Weneedyourthoughtsandsuggestions.HehasresponsibilityfortheU.S.BureauofReclamation (USBR)andtheU.S.GeologicalSurvey(USGS),andspecificallynotedtheimportanceofNOAAforecasting to determining water supplyavailability. Mr.Rosspickedupthepartnershipthemeandaddedthattheyhadthepowerasagrouptochange policy and priorities at our agencies. He stated that he started his career in San Diego on a water reuse project.Inthisjob,I’veaskedhowEPAcanincorporatewaterreuseunderourportfolioandwasdisappointed thatEPAhasn’tprogressedmoreonthisfront.EPAisdevelopingaframeworkforaNationalWaterReuse Action Plan as a national priority and will reach out to States andstakeholders. Whatcanwedobettertocoordinatefederalpolicy?WhatcanIcontribute?Rossnotedthatheand l Northey co-chair the National Drought Resiliency Partnership (NDRP). DOE’s Grand Water Challengeis addressing reuse of produced water. How can Icontribute? Dr. Gaulluadet observed that NOAA data, information and predictions is what makes water infrastructure work. He referred to Midwest flooding along the Missouri River, and 3-day excessive rainfall outlooks that provide lead time for emergency managers. The National Weather Service predicted with confidencethe50inchesofrainfromHurricaneHarveyinAugust2017thatfellinsomeareasnearHouston in 24 hours, which led to early evacuation orders. A graduate of the Scripps Institute of Oceanography, he alsomentionedpredictionofatmosphericrivereventsontheWestCoast.HenotedthattheFY2020budget includestheuseofdronesformappingflooding.Further,NOAAisworkingtotransformsatellitearchitecture from large federal missions to privatesystems. HealsodiscussedconsultationundertheEndangeredSpeciesAct(ESA)andeffortstocoordinate withmembersofthispaneltospeedthingsup.Theyarealsoworkingtoreduceby30%thetimeneededto complete National Environmental Policy Act (NEPA)reviews. Mr. Northey observed, “When we get together, we go often learn much about what we are doing.” AformerSecretaryoftheIowaDepartmentofAgriculture,hehadexperiencewithUSDA’sNaturalResources Conservation Service (NRCS), which has lots of private/organizational partners. Further,the RiskManagementAgencyprovidescropinsurancedeliveredthroughprivateagents.Weneedtotalk about how we functionally work together with States and within watersheds so our program requirements/regulations are more consistent. The 2018 Farm Bill gave us a little more flexibility with the regional partnership program. Wewant to hear from you how we can be more effective. There is a State Conservationist in every State. The Farm Service Agency has an executive director in every State. USDA isworkingonanideaforbuildingarevolvingfundforconservationprojects.Wearelookingforcreativeways to get moredone. RD James declared, “This is a pleasure compared to some of the meetings I have to go to!” Heis responsible for the Army’s Civil Works Program, which includes the U.S. Army Corps of Engineers. The Corps’mainmissionsarefloodcontrol,navigationandenvironmentalrestoration.TheCorpsdoesprojects. Once those projects begin to move forward, “…we have to deal with all these people [on the panel].” Mr. JamesservedformanyyearsasamemberoftheMississippiRiverCommission,soheunderstandspublic and stakeholder needs. In my 37 years of experience on the Mississippi with other federal agencies were “awful!” We waste time and dollars. We have to provide a smoother road forward. Currently the Missouri River flooding is absolutely awful. The Corps has to try to maximize multiple objectives(eight). AlexFitzsimmonsfocusedhisremarksonDOE’sWaterSecurityGrandChallengewhichaddresses improvingourcapabilitiesregardingdesalination,producedwaters,municipalwastewater,reducewateruse by thermal power plants. He also mentioned off-the-grid rural energy and water systems. He noted DOE, EPA and DOI are cooperating on a prized competition focused on research and development of next generationtechnologies. In response to questions, the panel noted that they have identified over 240 water-relatedworking groups,taskforcesanddifferentprograms.Theyaretryingtolisteverygroup“wehaveequityin.”Theyare alsoworkingtoinstitutionalizetheirorganizationandleveragetheirresourcestoaddressagencyprioritiesas agroup.SomeoftheareastheyseeaneedtoworktogetherincludetheColoradoRiver,theOgallalaAquifer andtheChesapeakeEstuary.Theyhavebegunaconstructivedialogueamongthefederalagencies,anda new effort to set goals and challenge themselves to find ways to meetgoals. Streamlining regulatory processes very important, as is moving towards “One Federal Decision.” Anotherconcernraisedwasthefactthatwithretirements,wearenotreplacingour“humaninfrastructure.” The Presidential Memorandum on Promoting the Reliable Supply and Delivery of Water in the West was mentioned. 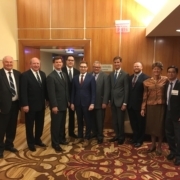 Apanelofnon-federalinterestsprecededtheabovediscussion,thatconsistedof:JulieCunningham, OklahomaWaterResourcesBoard;DarrenGore,CityofMurfreesboro,Tennessee;CherylZittle,SaltRiver ProjectandAgribusinessandWaterCouncilofArizona,HeidiMoltz,InterstateCommissiononthePotomac River Basin, and Ben Grumbles, Maryland Department of theEnvironment.